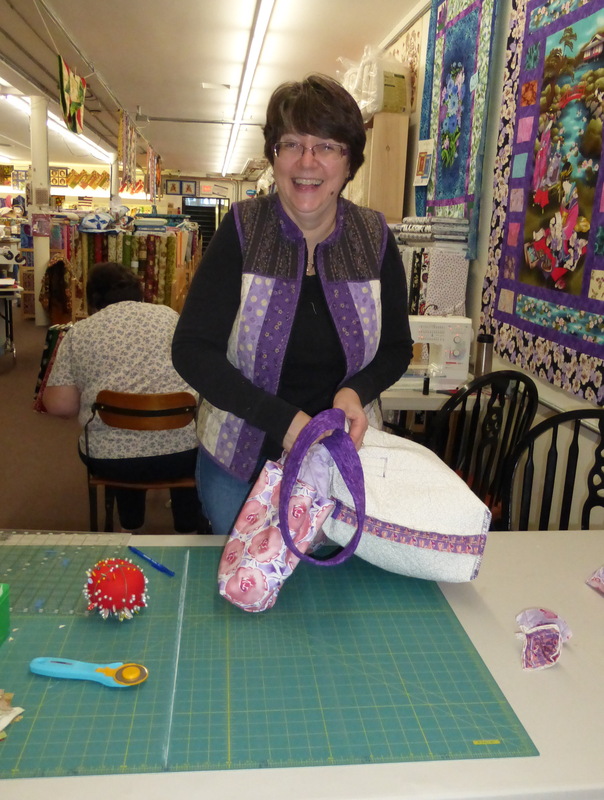 Yesterday I taught the Kerryn Tote Bag class at Quilter’s Common in Wakefield, MA. I had two students and Colette also joined us to work on a shop sample. 1. Add fusible interfacing to one of the lining pocket pieces to add more stability to the inside pocket section. 2. To shape the bottom of the bag: After sewing the pocket sectioning seams from “pocket top” to “pocket top”, sew two seams from one side to the other of the 36″ x 21″ bag and lining pieces. The seams should be 3″ apart in the center of the bag and lining pieces. It was great fun spending the day sewing with the ladies at the shop. I may be teaching the class again sometime in the future and will post when that is scheduled. In the mean time the pattern is for sale as a downloadable file in my Craftsy Shop. This entry was posted in Class, Patterns, Sewing, Totes and tagged bag, class, pattern, quilted, Quilters Common, tote on September 28, 2013 by pmegio. I finished my little house quilt last Friday, the 19th of April. I spent the day listening to the news and waiting for Suspect 2 in the Boston Marathon Bombings to be found and arrested. While listening I worked on this quilt. This terrible event hit close to home, as I work in Boston 3 days a week. But on that Friday I was safe at home working on this fabric picture of my house and hoping that the law enforcement officers would all be safe while doing their jobs. Thankfully no one else was injured or killed and now we can move on …. while remaining vigilant! This little quilt is 18″ x 18″. The story behind it is here … and to see a full size version of the finished quilt click on the thumbnail photo. 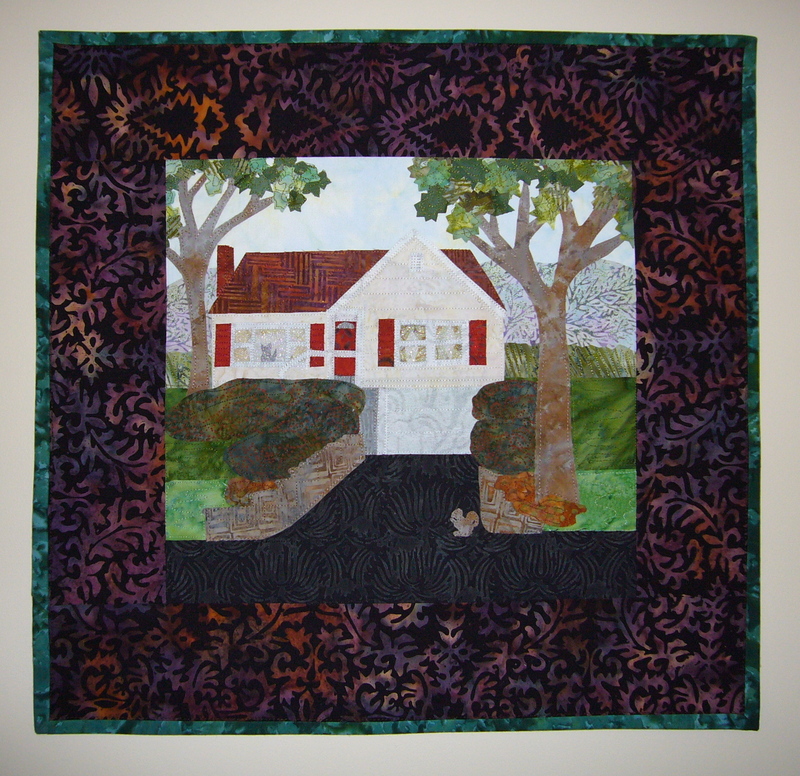 This entry was posted in Applique, Quilts and tagged applique, class, landscape, quilt on April 22, 2013 by pmegio.